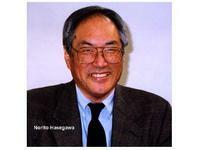 Dr. Norito HasegawaNorito Hasegawa is a retired dentist, an overextended hobbyist (considered commercial for tax purposes), is a 3 million miler travelling to many foreign countries talking and/or judging in places such as Japan, South Africa, Australia, Brazil, Canada, Denmark, Germany, New Zealand, Taiwan, England, France, Switzerland and many many cities in the USA. He is primarily a hybridizer of Slipper Orchids (Paphiopedilum) although his interests and collection of 15,000 orchids include miniature cattleyas, phalaenopsis, cymbidiums and variegated orchids of all sorts. He first became interested in orchids after seeing orchids in mass at the World Orchid Conference held in Long Beach in 1966. After he bought his first orchids, he failed miserably, but persisted in trying to grow them outdoors, and in no time he had hundreds. Now, he can’t imagine his life without orchids. Orchids are an endeavor of science, taxonomy, hybridizing, art, sociability, quiet reflections, and mad parties—join the addition and fun.